<="" font="" border="0" height="188" width="261" align="left"> Conveniently located in Mt. 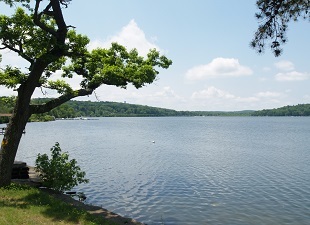 Olive Township, Morris County, Budd Lake has less than 10,000 residents. Homes in the area reflect that small town charm, and many have at least some view of the lake. There are a number of desirable 2- and 3-bedroon houses and single family units. There is also new construction underway in Budd Lake, and there will be a multitude of 4-bedroom colonial design homes available. These are 3000 sq. ft., overlooking the Lake. Anyone searching for a home in Budd Lake should enlist the help of expert real estate agent, Maryann Johnston. Maryann is an experienced pro and knows the Budd Lake area. Call her at 201-924-6451, and she can help you effectively work the system and find the best deals. She will have you in the Budd Lake home of your dreams! Budd Lake was once known as Hattacawanna Lake, certainly a name of Indian origin. It was later renamed for John Budd, a wealthy colonial land owner and one of the first white men in the region. The town itself was named after its famous landmark, the largest natural lake in the state. look at all of the beauty that surrounds this amazing body of water. Once you have the chance to view the area, you will understand what it is that makes so many people love to call this place their home. The Pax Amicus Castle Theatre is a local treasure -- a small town, non-profit repertory company dedicated to entertaining shows and training young performers. Their season is a mix of Shakespeare and other classics as well as contemporary comedies, musicals and dramas. For those who have families, head over to Stryker Airsoft and see how much fun you can have together. You will be able to partake in any number of different games and attractions all in one convenient location. Children and adults will enjoy being able to spend hours playing and burning off some energy all under one roof. Being able to take the time to explore all of the Budd Lake homes for sale will allow you to find exactly what it is that you want in your new home. Browse through all of the Budd Lake properties here on this site to find the home that best suits your needs. Make sure to call local real estate expert, Maryann Johnston, 202-9241-6451, about the different pieces of real estate in Budd Lake. She will be able to help you find some of the best homes for sale in Budd Lake. As a Budd Lake home buyer, you are sure to find the perfect home.